Iraq’s Assyrian Christians Betrayed by a Liberal West in an Identity Crisis. Well over 100 people were killed by extremists in Baghdad alone during the last month, including over 50 Assyrian Christians on the Black Sunday of 31st October. Mission accomplished? I don’t think so. Condemnation by all groups and states was received in the events that followed. The media dribbled out an isolated article here or there. There were murmurings behind closed doors about plight of the “Christians of Iraq”. However, what remains clear is the massive disparity between the anguish felt by the sizeable Assyrian Christian communities in Diaspora around the world and the inaction of their respective governments to put pressure on the Iraqi government to do much more than it is doing to ensure our safety. A series of demonstrations dubbed the Black Marches were organised around the world in more than 20 locations. Where is this reported? They generated a few whispers, but no on-going coverage, no 24 hour fascination typical of a lecherous around-the-clock media, and no special fieldwork assignments to discover why they were undertaken and what the goals were of the people demonstrating. This is not because the story itself was uninspiring, uncontroversial or timid. It was all of the opposite and more. 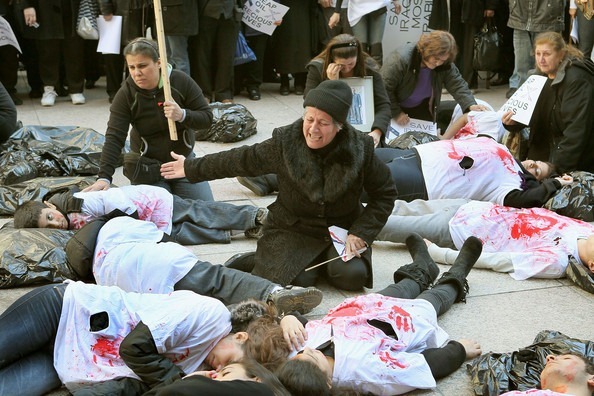 Symbolic display of those killed by volunteers in Chicago. Why? This is my reasoning. Western culture is increasingly becoming secular in all aspects of its society, be it politics, media, morality and communal society. This is important for a number of reasons. Chiefly, it has to do with this current perception and sentiment: the value of stories which are exclusively concerned with our humanity are more important and vital than other stories which are perceived to deviate from this norm. Its as if anything else would taint it with some nonsensical slant which would undermine its purity. Take the story of the trapped Chilean miners – one of perseverance and strength of human spirit in a war of attrition with the earth itself. It was a simple isolated story, and it received unabated worldwide coverage with an outpouring of support from all countries. The miners survived, ensuring a happy ending and a victory for our humanity, strength of will and compassion in the face of adversity and improbable odds, all neatly packaged for us to consume. Nice. Why was this more of a story than the Church massacre in Baghdad? This is a story where over 100 people were taken hostage in what represents an on-going assault on the Christians of Iraq. The dead had mothers, fathers, brothers, sisters, wives, husbands, and children too. Where were their interviews? Where were the messages of support? Where was all of the aid and news coverage? Where was all of the coverage of demonstrations around the world which prompted tens of thousands to take to the streets? Aftermath of the Church massacre. All of this greatly troubles me, and I have come to a number of conclusions. My first conclusion is this: this event is painted as a religious conflict, and religious conflicts are notorious for bigoted opinions and endemic senseless violence. More importantly, religious conflicts are the stuff for savages in far away lands, not concerning us and our limited reserves of compassion we ration out when persistently prodded to by our fickle media. The siege against the Christians of Iraq is usually absorbed by the bigger picture and fuzzy message of “Hey, everyone is suffering. Everything is generally OK though”. My second conclusion is this: the wall of apathy which manifests in light of these mass murders stems of the West’s inability to reach deeper inside this cauldron of supernatural folly (religion) and grasp the human element which lies at the heart of it. This isn’t just“one group of religious people killing another group in the name of religion”, this is one group of people being killed – for whatever reason. This is not simply a religious conflict, it is a human tragedy which is often overshadowed because of the now distasteful religious element. Its almost as if “looking at the bigger picture” comes first now, with the particulars not even touched upon. This odd kind of relativist principle handicaps any meaningful appraisal of the problem. The Western media is unable to report and comment effectively on this issue in Iraq. It also seems Western politicians are all too eager to downplay their power and influence when it suits them. If a picture requires a smile, expect everyone to be there. If not, you’re on your own, regardless of whether Western forces illegally invaded and rapidly accelerated the nationwide targeting and subjugation of the Assyrians. Where is the coverage of what these people want? Let us not forget the historical bond between Britain and the Assyrians too. Thousands of demonstrators take to the streets in Sweden. This is the reason why a mainstream liberal’s philosophy, as it is now, is bankrupt. This is also why there was (and still is) so much contempt for the Labour Party. All of this inflicts a grievous wound on my present sensibilities. After all, a liberal agenda is supposed to champion the rights of minorities and disadvantaged people. At the moment, these principles are hamstrung by a generalisation of the problem to project some kind of false grander, more worldly view. These problems are localised and considering them to be otherwise is criminal. Newspapers which used to represent general reading for me like The Guardian have betrayed their own objectives with convenient double standards. An unlikely ally in all of this has been the Conservative base, with their appreciation of the “Christian factor” and its preservation in a hostile environment. However, as mentioned previously, this is a human tragedy. Spitting fire about those abusing Christians will not improve their lives. This energy must return its focus to the needs of the people who are being oppressed. These “Christians” have names too, a unique culture, a unique language, and a unique history – let us not concede to the Arabisation campaign. As the first inhabitants of ancient Iraq, Assyrians have suffered at the hands of Ottoman Turks, Kurds, Nationalist Arabs and Islamic extremists. However, they are resolute in the face of this long-lived adversity. They have heart and they have spirit. They will not break, and we all must support them to finally alleviate them from the third-class citizenship they experience in their ancestral land. 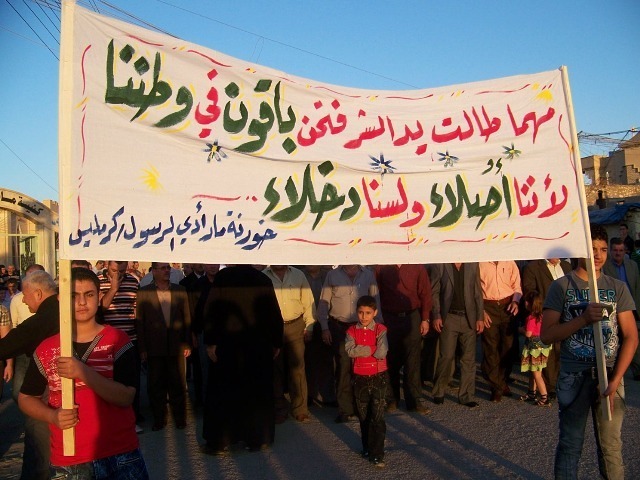 Northern Iraq, loosely translated: No matter where the hand of evil reaches, we are not guests in this country, we are natives and we will stay. Anything less would be a grand betrayal, dwarfing even the broken promise made by the Allies after WWII to finally grant their steadfast Assyrian allies a homeland. What is happening now is a threat on the Assyrians’ existence. The scattered Diaspora communities are strong, but nothing is certain without any presence in their place of origin. This highlights the key failing of today’s liberal agenda – it has no grasp, and therefore, empathy of the suffering of persecuted minorities such as the Assyrians of Iraq. It sadly resembles something of a liberal fascism. Edges are wrongly straightened in an attempt to appear intellectually receptive to larger ideas and longer perspectives. This should not be the case. A liberal should be proud and stalwart in defending the rights of minority groups without feeling they are betraying some abstract holistic principle which has become obscure to the point of contempt. It is a sacrifice made in the mainstream of liberal media and politics. It is a wrong sacrifice to make, for liberty must be defended as well as granted. The sacrifice is ultimately made because of an unhealthy preoccupation with the guilt only an educated westerner could feel at the colossal mess of oppressive nationalist dictatorships, ruling monarchies, and theocracies which populate the Middle East. Sadly, because this preoccupation originates in shame, great crimes are glossed over and unreported in an attempt to remain impartial. Thus, the line being towed by mainstream liberals is often one of (rightful) anger directed at Bush and Blair and their frankly stupid adventure in the region. However, focusing the frustration on this issue is favouring the easy option of pointing the finger over actually cleaning up the mess. “Fine, but what else?” must naturally follow. The other side of the coin involves focusing on the extremists and making derogatory comments about Islam itself. This is highly unhelpful and in some cases extremely damaging for the people who have the suffer the consequences of these kind of revenge fantasies. So you have two reactions: first, “damn Bush and Blair”, and second, “damn those bloody Muslims…”. What’s lost in all of that vitriol? The very people who are subject to the suffering. 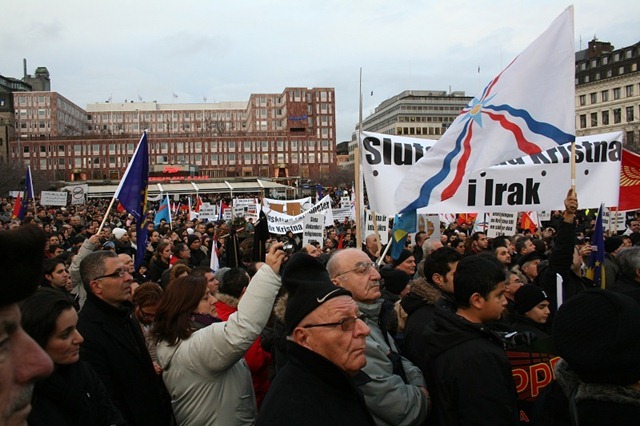 – There were reportedly 1.4m Assyrians in Iraq 10 years ago, now fewer than 500,000 remain. Genocide? No! “natural immigration”. 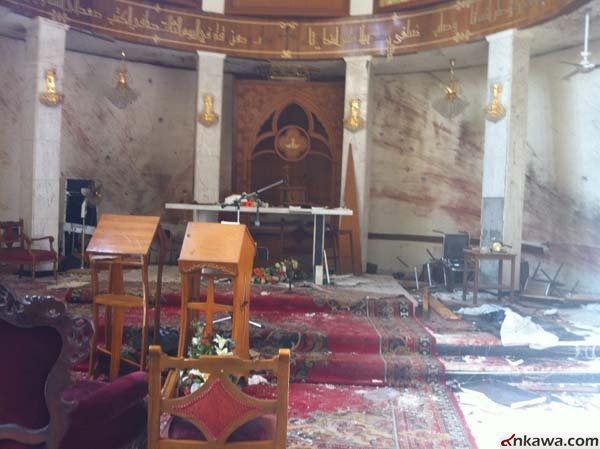 – 66 Churches have been bombed or attacked since 2003. Targeting? No! All Iraqis are suffering equally. – Over 800 Assyrian Christians killed since 2003. Come on, this must be targeting! No! We don’t bother with population statistics and ratio of attacks when it doesn’t suit our hazy argument. – Thousands of refugees congregate in ghettos in Syria, Jordan and Iran, stricken in poverty, with no help, employment, or voice – positively in Limbo, ready to move again. What about their stories? No! We don’t know what to ask them at this point anyway. – Thousands more look longingly to the West, most afraid to criticise in fear of being rejected asylum and sent back to their nightmare life without rights, security and a fair shot at life. Refugee crisis? No! Ok maybe, but, er, *rewind* there are other people suffering too. – Assyrian Christians are said to make up 3-5% of Iraq’s population, yet reports from international NGOs state they represent 40-50% of the Internally Displaced Peoples (IDPs) and refugees in surrounding territories and the West. How about now? Bigot! Our story is simply lost amid generalisations. Iraq is viewed as a blanket mess not worth sifting through. There is no doubt that all Iraqis are suffering, but none are suffering more than the Assyrian Christian ethno-religious minority, and that must be made clear. More must be done as this is the case. What we get here is a hollow liberal agenda which condescendingly overlooks particularities and complex problems, and a conservatism more often concerned with attacking our persecutors than empowering the very people who are being attacked. So, who says there is too much bad news? The fact is there isn’t enough. Tuition Fees and Cultivating Excellence – What Does the Future Hold?